176 lb Hold Force: 1.890" (48mm) diameter x 0.453" (11.50mm) cap thickness x 0.945" (24mm) overall height with an M8 outside screw shaft cap magnet / pot magnet. All dimensions +/- 0.5 mm tolerance. NOTE: All Holding Forces are approximate values. Actual Holding Forces will depend upon several factors....read below for more info. Magnet: Neodymium Disc Magnet, Grade N35, Nickel plated. Cap Magnets, also known as Pot Magnets or Mounting Magnets, utilize a balance between a strong neodymium magnet and magnetic steel to produce a strong holding force. Cap Magnets / Pot Magnets are used in applications where a strong holding magnet is required and the pull force of a regular disc magnet or ring magnet will not produce enough holding force. Cap Magnets / Pot Magnets are made in different versions to fit your mounting application. Cap magnets can have a threaded screw on the top, a threaded rod to fit a screw or bolt, or a through hole. These holding magnets are also manufactured with a counter sunk hole to fit a screw with a tapered head. Choosing the correct cap magnet / pot magnet usually includes three (3) main factors: the amount of holding force needed, the general size requirements, and the mounting requirement. Usually the holding force is the first priority, so picking the correct cap magnets / pot magnets may require flexibility with the other 2 factors. One other factor to consider is the dimensional tolerances of these holding magnets. The tolerances will be larger than an individual disc magnet or ring magnet due to the manufacturing process. The pull force and holding force of holding magnets vary due to several factors. This includes the chemistry and thickness of the ferrous material the cap magnet / pot magnet will adhere to, the surface finish of the ferrous material, and the air gap between the holding magnet and the metal surface. While an estimated pull force can be calculated using software calculations, it is always recommended that actual testing is done using the correct size needed. 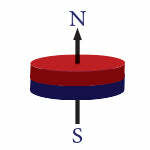 Need assistance from SuperMagnetMan’s technical magnet staff with your holding magnet requirement? Contact us, or use our online custom magnet quote form to start the discussion. For a list of neodymium magnet materials and their characteristics, visit our Magnet Tables section. Use care and caution when handling strong magnets, as outlined in our Magnet Safety section.